Concern for the health and safety when caring for small domestic animals are one thing, but the economic factors and fast spread of infection become increasingly important with larger scale animal care as well as mass exposure. 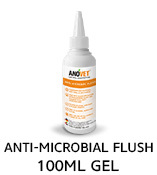 ANOVET® offers for the first time a health promoting, biological, and ecosystemic solution to disinfection with no rinse, waiting or worry. It can also be used in drinking water or fodder to reduce drug addition, requiring low application concentrations for efficiency, all with cost efficiency in its multi spectrum usage. 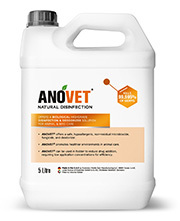 ANOVET® is safe, hypoallergenic, and non-residual while helping prevent infectious diseases through promoting healthier environments, thus reducing mortality rate. 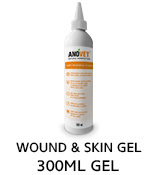 ANOVET® specialty line for easier applications including Anti-Microbial Flash (which specializes in nasolacrimal flush, ear cleaning and all duct infection care) and Wounds & Skin Gel (which acts like a protective gel film for all wounds, cuts, abrasions, infections, sores, & allergies). I first saw the disinfectant work its magic on a kitten with a fungal infection. It did not irritate her skin at all. I then decided to try it on a few horses, which had skin problems that varied in severity – from, suspected fungal infections to secondary bacterial infection. As an average, literally FOUR days were enough to see such a huge difference! The horses grew their coat back and looked wonderful. Clients were also very pleased and surprised with the results too! I can confidently say to my clients “ this product is VERY safe and PROVEN to do as it says. We have been using ANOVET® to disinfect the 12,000sq ft facility. The product seemed too good to be true on paper but once we started using the fogger the effects were noticeable: less smell, cleaner surfaces, no irritating reactions for the pets. The best feature for us is that it can be used around the pets without having to evacuate the area as we have boarders all year around. We have noticed less spread of bacterial and airborne diseases - which can be difficult to contain in places like this - since using ANOVET® every 2-3 days. We are also disinfecting all surfaces and feeding bowls with and have recently began using it for wound care. It is a very versatile product and we are pleased to have found it in the UAE. 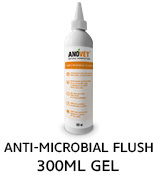 We have been using ANOVET® to disinfect the foaling barn, delivery rooms to control and prevent any type of infection. We started using the fogger the effects were noticeable it has less smell, no harm for horses and young foals and it can be used on hay, in water buckets and feeding area of horses. The best feature for us is that it can be used around and inside the stables without having to evacuate the stable from horses.